I hope you all had an amazing Thanksgiving feast sharing beautiful food and wine with friends and family. Now that the big feast is over, it might just be time to treat yourself to a warm, cozy night in with a good bottle of wine. We did just that on a recent date-night in, I decided to make us a dinner that jumped fully onboard with the fall season. The dish we made also give provides the perfect place to reuse some of your Thanksgiving leftover vegetables. Mount Veeder is one of Napa’s mountain appellations and I thought I’d use this opportunity to get to know this one a little better. Why should you care about mountain versus valley fruit? It’s yet another factor affecting the flavors in your wine and knowing the general differences is another helpful tool in getting you to a bottle you’ll enjoy. The higher elevation of these AVA’s in general tend to bring more concentrated fruit notes and more pronounced tannins than found in wines from the valley floor. These wines are often lauded for their ageability and those tannins are a big contributing factor. On the other hand, valley wines are often thought of as being riper, with generous fruit, and rounder structure that is often more pleasurable earlier on. These are generalities and there are a million and one contributing factors to how a wine tastes, not the least of which is the winemaker’s influence. Take each as a puzzle piece making up the full flavor picture. Now let’s get to know Mount Veeder. Or feel free to skip ahead if you really just want to get to the food. 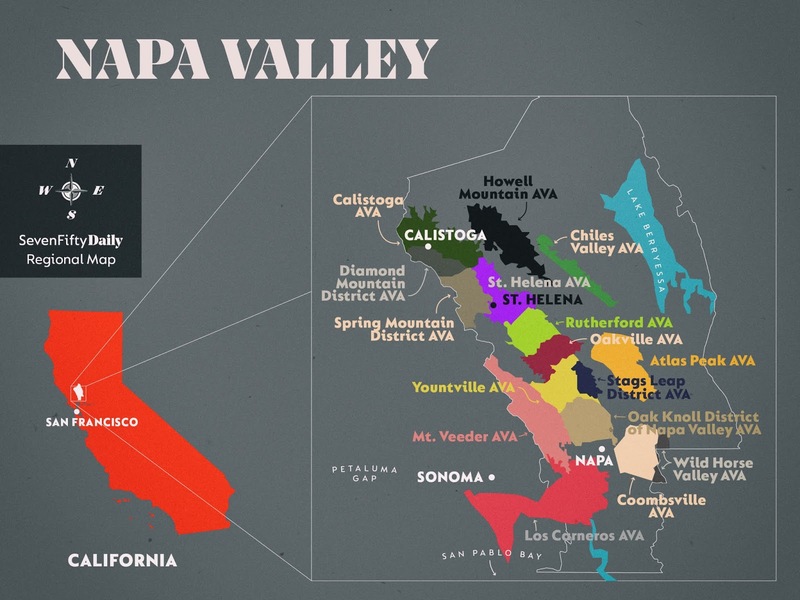 Whether comes from a mountain or valley region doesn’t always appear directly on the bottle, but in Napa’s case, the five mountain appellations all give you a clue in their name: Howell Mountain, Diamond Mountain, Spring Mountain, Atlas Peak, and Mount Veeder which is our subject today. Each of the mountain AVA’s has its own personality beyond their commonalities as high elevation regions. Mount Veeder sits in the southwestern section of Napa Valley, just north of Carneros. It also marks the boundary between Napa and Sonoma counties, and it’s very close to both the actual towns of Napa and Sonoma. You wouldn’t know it though. As you start to drive up the mountain roads, you start to feel like you’re in a completely different world very quickly. Climate: Cool to moderate, with most vineyards above the fog-line, meaning warmer nights and cooler days and less diurnal range than the valley floor. Typical mid-summer high temperatures about 85°F (29°C). Elevation: 500 to 2600 feet (152 to 792 m). Mount Veeder is one of the largest appellations in terms of land area, but it is land that’s really hard to work thanks to steep, rugged slopes that are covered with pine and oak trees. The soils are also really rocky and stony, with pockets of tufa, a white ashy soil. They’re certainly not fertile soils, and they have trouble retaining water. All of this restrains the vigor of the vines and leads to low yields. So while they’re really freak’n hard to grow, the grapes they do get have concentrated flavors, minerality, and strong tannins. There are many microclimates hidden within the expanse of the area for the vineyards that have been planted. The region borders San Pablo Bay, which brings cooling maritime influences, particularly in the southern sections, which adds fresh acidity to mix. Many of the slopes that are planted to vines get lots of sunshine, which helps ripen the grapes nicely. Mt. Brave’s vineyards do in fact sit above the fog line, so it’s nice and sunny, creating ample fruit notes. This works with soil factors above to lend an approachability to those strong tannins that, especially when compared to some other Napa mountain AVA’s. Nonetheless, tannin and acidity both help to preserve a wine, you can probably guess that these are wines that can also age. We definitely saw all of these structure components at work in today’s wine. We all know that Napa is Cab country, but I wouldn’t count Merlot out. There are many really lovely versions. For one thing they’re usually a little less expensive than the Cabs, can deliver plenty of drinking pleasure, and I think are often more food friendly. And as we’ve learned above, you can find versions with plenty of structure, which Merlot is often faulted for lacking. Lack of structure was definitely not a problem here. The Mt. Brave Merlot Mount Veeder 2015 had plenty. In fact, I kind of felt it drank like Cab; just one you could open earlier. It was robust, with medium+ tannins that were nicely rounded. The wine was full bodied with high alcohol, but it wore it all well thanks to medium/medium + acidity. I have to say, the wine had more freshness than I expected to find and that really balanced all the richness well for me. On the palate, Greg and I got lots of rich dark fruit notes: blackberries, spiced plum tart, saucy raspberries, currants, and even some blue fruits. There were notes of mocha, baking spice, and sweet licorice. There was even an unexpected herbal note that whispered of mint and cedar, adding lift and interest to the palate. This is a wine that can stand up to some richer fare. The arrival of fall also had me in the mood for braised meats. 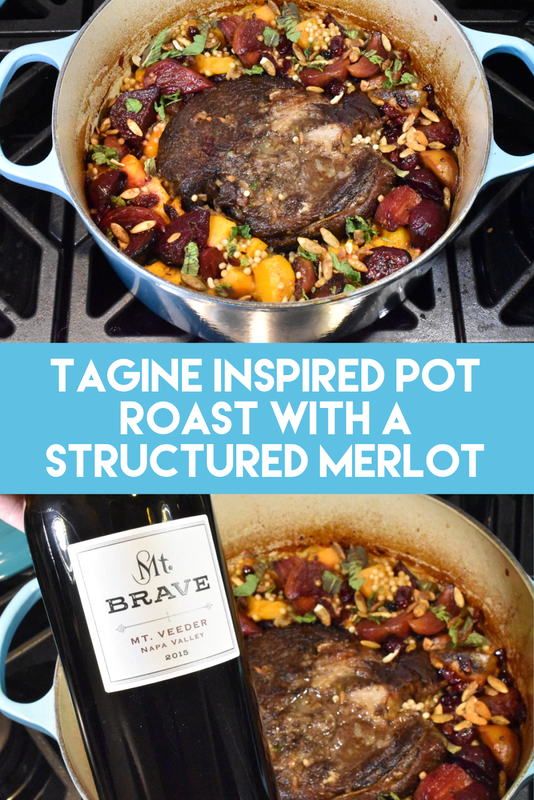 We ultimately decided on creating a tagine-inspired pot roast that would pull in a lot of the spice notes in the wine. Running on that tagine inspiration, I added couscous (although I opted for the Israeli style) straight into the cooking liquid to create a one-pot meal. I'd recently roasted pumpkins and beets for dinners at home, and I thought they’d make perfect additions to this fall feast, as well as working with the wine. I added the leftovers right into the pot at the end of cooking, along with a handful of dried cranberries. A great use of leftovers! If you don’t have these root veggies previously cooked and on hand, no worries. Throw them in during the last hour of cooking. I added a light garnish of chopped mint at the end to play to that herbal note we’d picked up, and I sprinkled on some candied, toasted pumpkin seeds to really take the autumnal vibes over the top. This was an excellent match. I was slightly worried that the sweetness of the beets and pumpkin (not to mention those candied pumpkin seeds) would be pushing the limits of what the wine could take. It wasn’t an issue. While the wine did become less fruity against these sweet components, it did not become sour or bitter as can often be the case when sugars in food overpower a dry wine. It was still robust with a silky mouthfeel. With fruit taking a slight step to the side, the wine’s minerality showed through a bit more, IMHO. The spices in the dish matched those in the wine really well, and it was an excellent companion to the stewed meat. Happy autumn vibes galore! I reached out to Mount Brave’s winemaker, Chris Carpenter, via their PR team to find out what he likes to enjoy this wine with. Here’s what he wrote back: “The signature concentrated blue fruit of Mt. Veeder is on display with the 2015 Mt. Brave Merlot, which pairs well with the distinct flavors of lamb. The notes of mocha and the long finish make this wine a nice match for a lamb porterhouse with dried fruit and braised chard.” I can definitely see this working deliciously with a big lamb steak. Chris also founded the Napa Valley chapter of Slow Foods and was a member of the Board of Directors for Slow Food USA, so you know he takes his food seriously. If you’re looking at other Merlots (given that this one is quite pricey) ask your wine store sales associate for options at the fuller end of the spectrum. We also sampled this dish with a more medium bodied Merlot with a less tannic structure and a more red-fruited flavor profile. While it made for a decent match, it was decidedly not as good. If you’re looking for other wines to match this dish, look for ripe, fruit forward, but robust wines with spice notes. Fruit forward Cabs, Syrahs, Malbecs, and Zinfandels (at the fuller end of Zin) with smooth, ripe tannins could all make good options here. Taken from the tech sheet. Winemaking: Grapes were hand-harvested in the cool morning hours, at an average Brix of 26.5°. The wine was fermented in stainless steel and then underwent native malolactic fermentation in barrels to round the acidity and softly integrate the vanillin character of French oak. After barrel aging, the wine was bottled without fining or filtration. Barrel Aging: 22 months in French Oak, 95% new. In addition to being winemaker at Mt. Brave, Chris Carpenter is also the winemaker for La Jota, Cardinale, and Lokoya––all are part of Jackson Family Wines Collection. The SRP and the average price on this wine is $80, which I’ll admit is out of my usual monetary wheelhouse. This most definitely is a Splurge in my book, but don’t we all enjoy a nice splurge from time to time? If you’re in the mood to treat yourself, go for it. Pro tip: Napa is best known for it's Cabernet Sauvignons and those wines command REALLY hefty price tags. To find better values in a pricey region like Napa, try exploring other grapes. If you love those Cabs, Merlot is an excellent candidate because the two have a lot of flavor notes in common. Moreover, these two grapes have a long history as blending partners (for example, they're traditionally combined in Bordeaux), and often you'll even find a splash of Merlot blended in with varietally labeled Cabs. So while an $80 Merlot may seem like a lot, it can actually present a value proposition and a good alternative for lovers of Napa's Cabs. Total cooking time: 2 hours 10 minutes. 2. Mix together the pepper, nutmeg, cinnamon, allspice in a bowl. Place the pot roast on a cutting board. Sprinkle generously with salt and about half of the spice. Rub the salt and spice mixture in to the meat and distribute well. 3. Heat a little bit of cooking oil in a Dutch oven over medium-high heat. Once the oil is shimmering add the meat to pot and sear well on all sides until well browned. Transfer the meat out of the pan. 4. Remove excess grease from the pan if needed. Deglaze the pan with a little bit of beef stock. Add the shallots and garlic to the pan a cook for about a minute. Add the beef back to the pan and pour in a cup of the stock into the pan. Add additional salt and spice mixture, reserving a little for the end. Cover and put in the oven. Cook for 50 minutes. 5. Uncover and baste the pot roast. Continue to cook uncovered for another 40 minutes. Note: If your beets and pumpkin were not previously cooked, add them in now. 6. Baste the beef again. Add the Israeli couscous, the beets, pumpkin, and dried cranberries to the juices collected around the beef. Add another cup of beef stock. (If the liquid in the pan has evaporated quite a bit, use a little bit more.) Cook for an additional 15 minutes. 7. Remove the pot from the oven. Taste and add more seasoning if desired. Carefully remove the kitchen twine from the beef. Garnish with the mint and the pumpkin seeds and serve. 7x7: Valley Wines vs. Mountain Wines: Is There a Difference in Taste?